Mrs. Geraldine Wislock passed away suddenly but peacefully on Wednesday at St. Peter’s University Medical Center in New Brunswick surrounded by her loving family. She was 81 years old. “Geri” grew up in Mt. Carmel, PA where she attended Mt. Carmel H.S. She moved to Somerset 56 years ago with her husband William. A very loving and caring wife, mother, grandmother and friend, Geri was a parishioner of St. Matthias Church in Somerset, a member of the church’s Altar Rosary Society and often would assist as an usher at the Saturday evening mass. She enjoyed being a member of the “Table 12 Group” at the Franklin Township Senior Center. Geri took great pride in the Somerset neighborhood she moved into over 50 years ago and made sure she always looked out for her neighbors. There is nothing she enjoyed more than being around her children and grandchildren, hosting holiday get-togethers every year and attending all the important grandmotherly functions she possibly could. And nobody – NOBODY - made a better pierogi than she did! She was predeceased by her beloved sister Irene Redd. 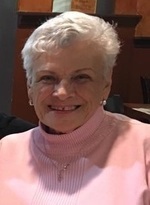 Geri is survived by her husband of 56 years, William Wislock and her children, son Brian and his wife Jacqueline of Kendall Park and daughter Carol Devine and her husband JD of Bethlehem, PA. She is also survived by her four grandchildren Patrick and Kevin Devine and Drew and Ryan Wislock. Visiting will take place at the Gleason Funeral Home 1360 Hamilton Street in Somerset from 2-6 on Sunday. Funeral services will begin on Monday at 8:30 AM at the funeral and a funeral mass will take place at 9 AM at St. Matthias Church in Somerset. Interment will follow at Franklin Memorial Park in North Brunswick.